Behavior Modification. This technique aims to correct the undesirable behaviors of your staff by letting them recognize the strong connection between the way they behave and the consequences of their actions. Reward System. This is one of the best ways to manage people and motivate them to perform better. The only thing that you need to do is to regularly offer rewards to any employee whose performance exceeds your expectations. Efficiency Wages. This type of wage is that which is established at an amount higher than the market clearing wage with an aim of encouraging customer loyalty, discouraging any form of shirking by increasing the risk of getting fired, raising morale, raising group output norms and improving the pool of applicants. If you want to work as a manager, then it is imperative that you improve your skills when it comes to handling and managing people by enrolling in the managing people certification program which is now available at Brainmeasures. The managing people course offered by Brainmeasures makes it a point to explain all the people management techniques that you can use when running your department. This certification course also allows you to obtain a clearer background about the importance of effective people management in terms of boosting the productivity in your workplace. This online certification course also offers a highly comprehensive and reliable managing people training which allows you to understand all the procedures and strategies that you can use in motivating your staff to improve their performance. Successfully completing this managing people certification course gives you the opportunity to receive your skill certificate and start working as an expert in the field. How to manage people even on the most challenging and difficult situations? How to manage power, stress and conflict within your team? 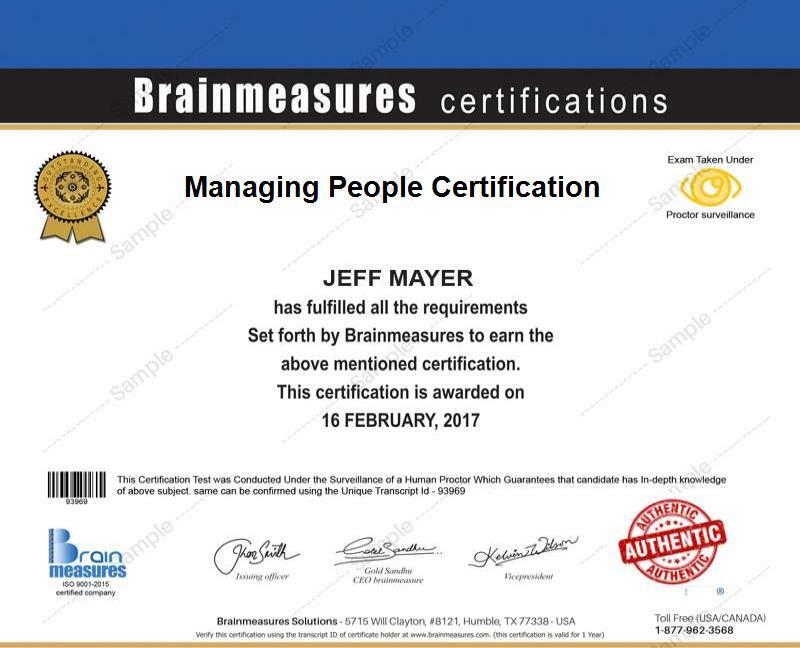 The managing people certification program which is now available at Brainmeasures aims to help various professional managers who want to make sure that the members of the team or department that they are running continue to perform their functions at the highest level. It is most suitable for entry-level managers, shift supervisors, certified managers, administrative personnel and any other professional who are holding management responsibilities and desiring to further improve their priority management and people management skills. Receiving your managing people certification is a major help when it comes to increasing the level of your income as well. As a managing people certification holder, you get the chance to earn an average annual salary of $80,000. You can expect this amount to grow up to $91,000 to $129,000 as you gain more experience in the field and you finally hold bigger positions with bigger responsibilities in an organization.